The Daily File is the agenda of business for each legislative day. This publication shows all measures eligible for Floor action, listed in the order that they may be taken up. All legislative actions taken on the measures are listed below the bill titles. Also, an item number is assigned to each bill, which changes from day to day. 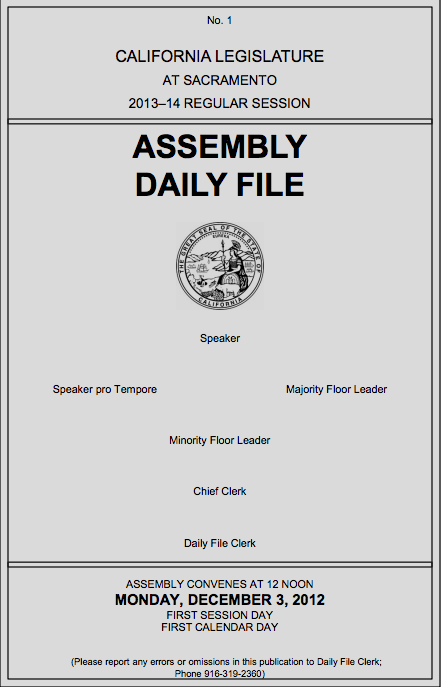 To the right is a representation of the cover of an Assembly Daily File. Below is the link to the current Daily File. The first Daily File for the 2015-16 Session will be published the first Legislative day after the session has been organized.